Diethood » Home » Spin the Pastry! Happy New Year! I can still say that, right? Well, yes I can because today (yesterday) is Old New Year (Стара Нова Година)! I’ll explain: Since we (Eastern Orthodox Christians) celebrated Christmas last Friday, New Year’s Day would then have to be today, right? January 14th denotes the orthodox new year and the traditional new year’s celebration among Macedonians and other Eastern Orthodox communities. As in most countries which use the Gregorian calendar, we also celebrate New Year’s Day on the 1st of January, but the New Year by the Julian calendar is still informally observed. On this day families get together and celebrate with traditional meals, singing, and drinking – of course. 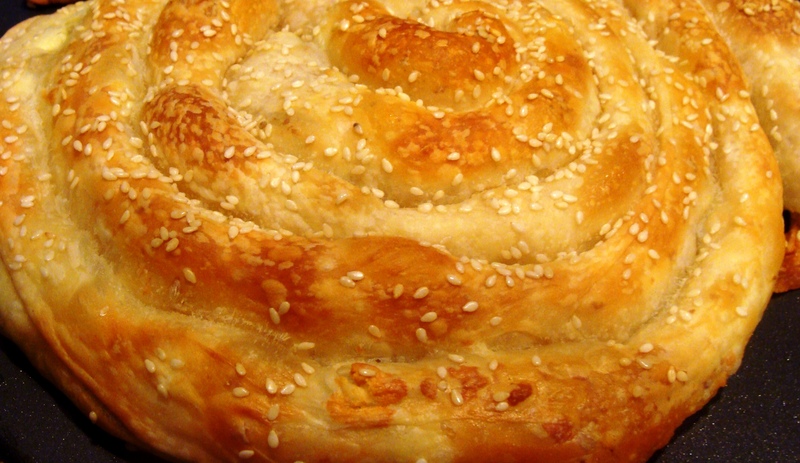 But, the celebrations among Macedonians can’t start without one key item; Maznik (mahz-neek). 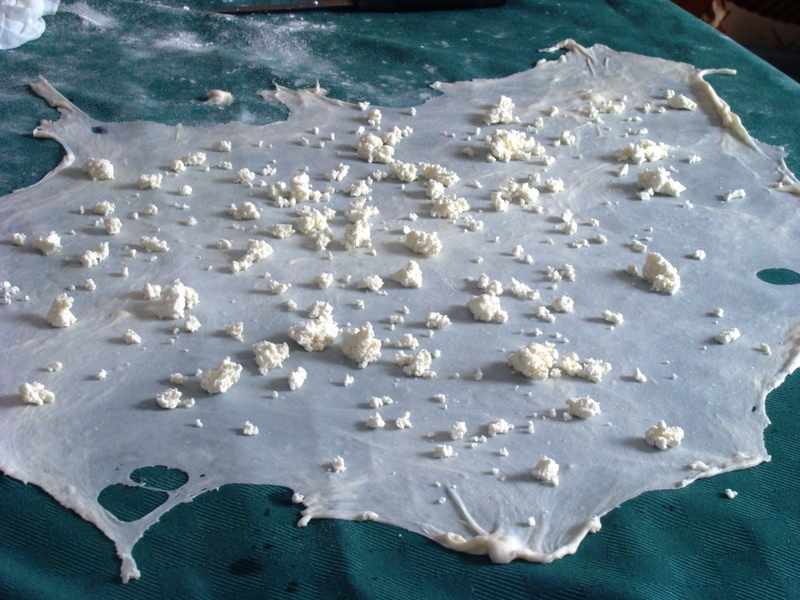 This is a traditional Macedonian handmade pastry filled with crumbled white cheese, similar to feta. Before baking, we place a coin underneath the Maznik and when done, each family member is cut a slice. Before removing the slices, the tray with the Maznik is spun three times and the person that gets the slice with the coin underneath it, has a year of Good Luck! My niece, Teodora, will be the one to enjoy all that luck this year! Congrats to my sweet little niece! 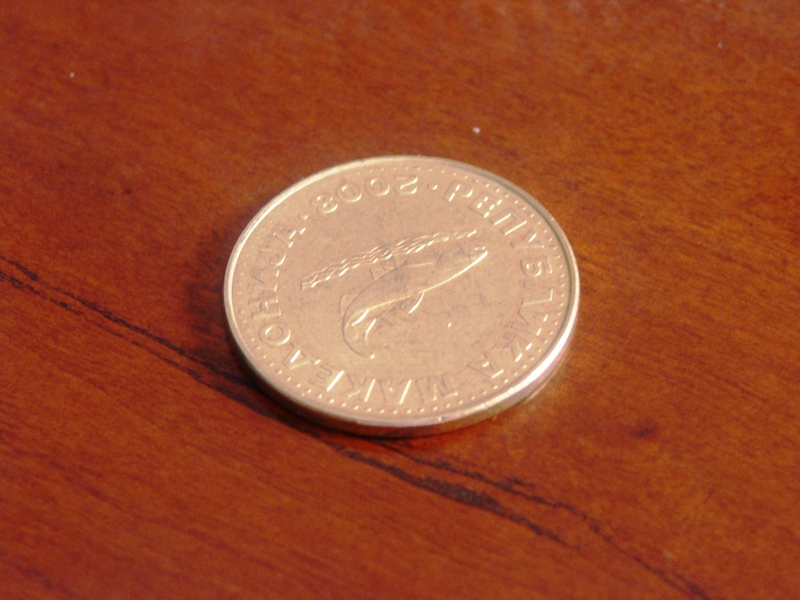 The tradition of the coin in the Maznik is associated with Vasilica – or the legend of St. Basil. On this day we celebrate both, Old New Year and St. Basil. The legend states that St. Basil asked the citizens of Caesarea to raise money so to stop the siege of their city. Each member of the city gave whatever they had in gold and jewelery. When the money was raised, the enemy called off the siege! Preheat oven at 425. When the Maznik is put in the oven, lower the temperature to 375. 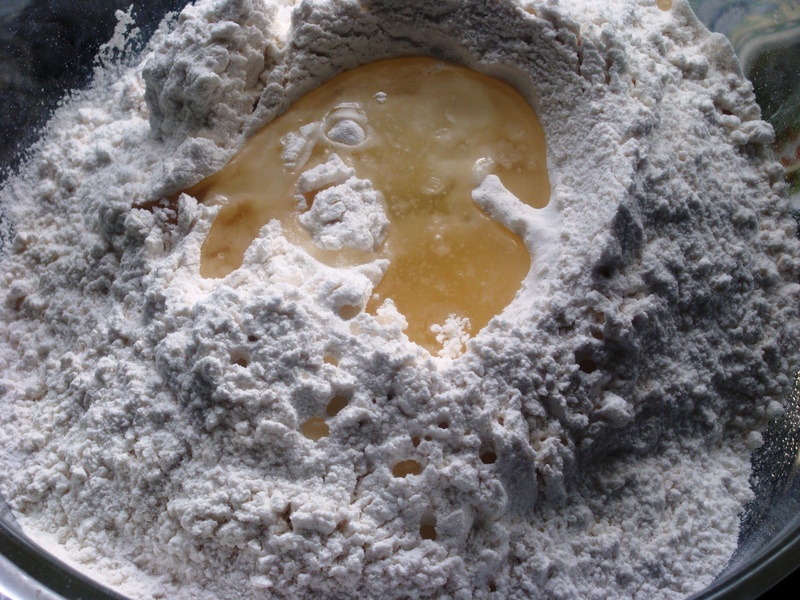 Place the flour and salt in a large mixing bowl. Make a well in the center and pour in the white vinegar and oil. Bring the bowl over to a stand mixer with dough hook attachments and begin to pour in the water, a little bit at a time, as you start up the mixer. Knead the dough until you get a nice shiny ball of dough. Spray a large round tray – pizza tray works best – with vegetable oil. Oil up your hands and begin to break off 1/6 of the dough that you prepared. 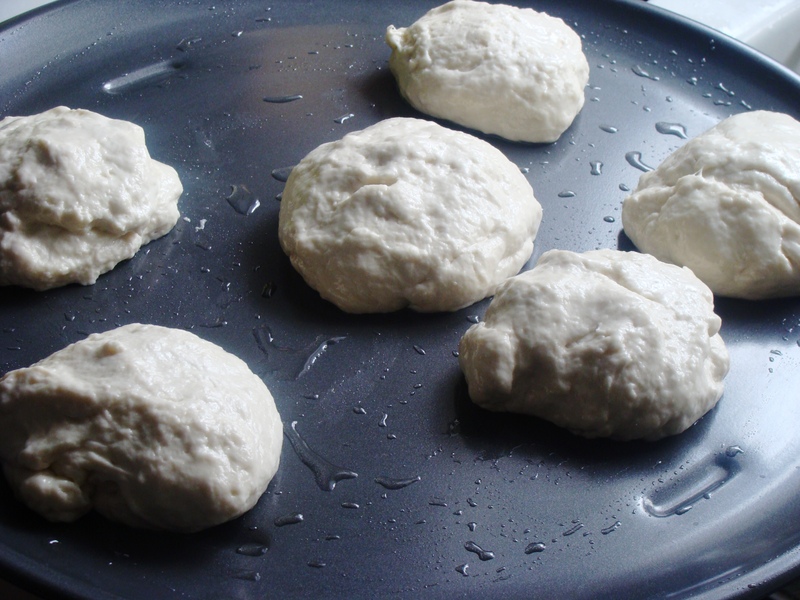 Form the piece of dough into a round ball and place it on the pizza tray. Continue to do this with the rest of the dough. You should have six round oiled balls of dough. 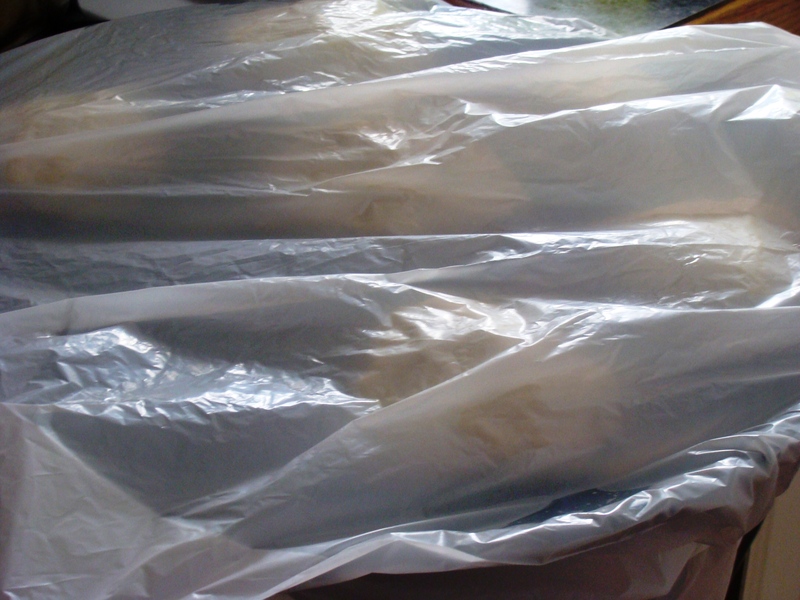 Cover the tray with a plastic bag and let it rest for an hour. Take one of the dough balls and bring it over to the tablecloth. With oiled hands, knead again into an even ball, then flatten it using the palm of your hand. 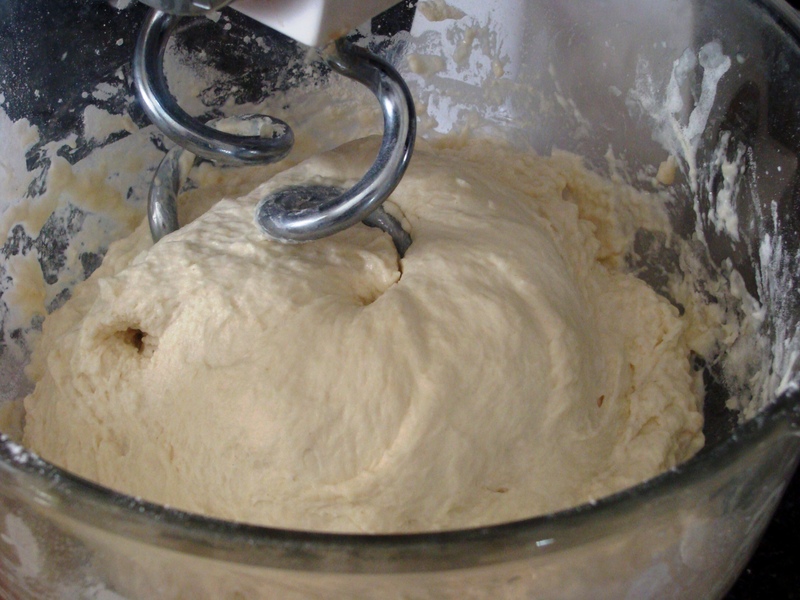 Pick up the dough by holding it by an edge; gravity will help stretch it as it hangs. 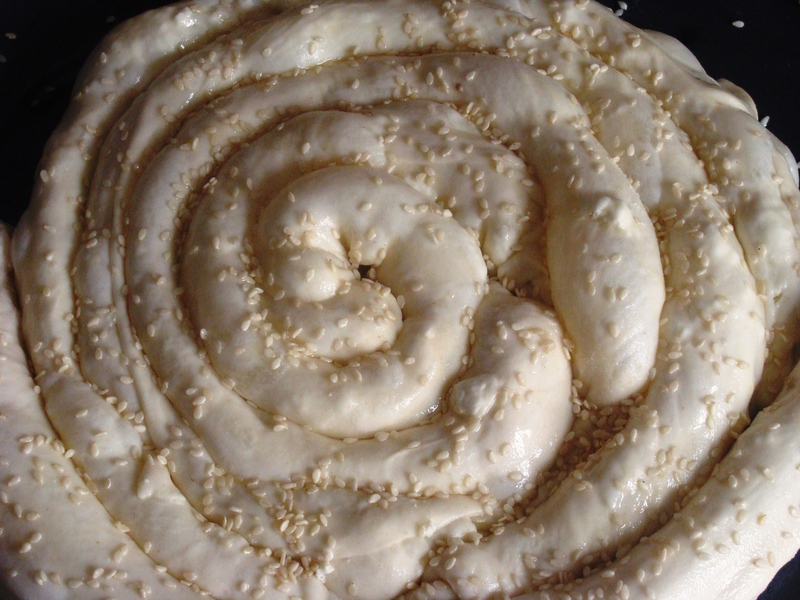 Use the back of your hands to stretch and pull the dough. 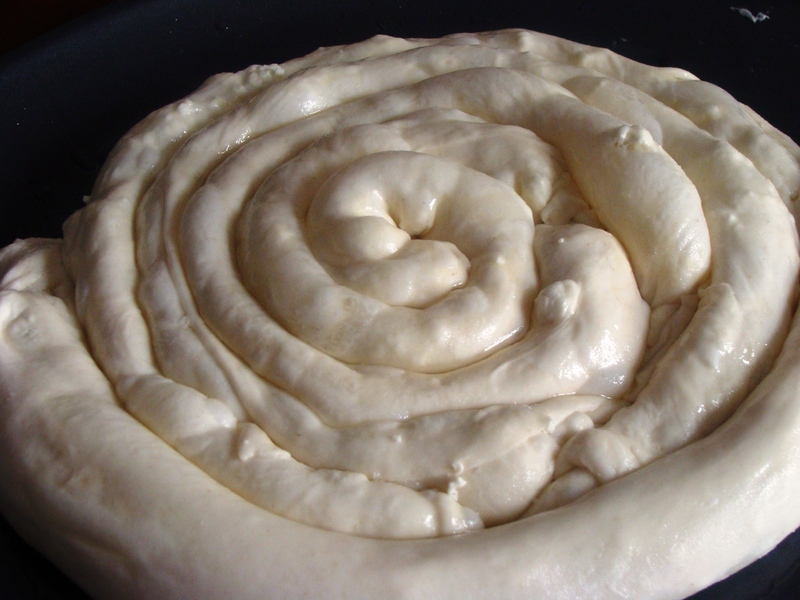 Put the dough back down on your work area and begin to gently stretch and pull the dough by using your thumb and index finger. 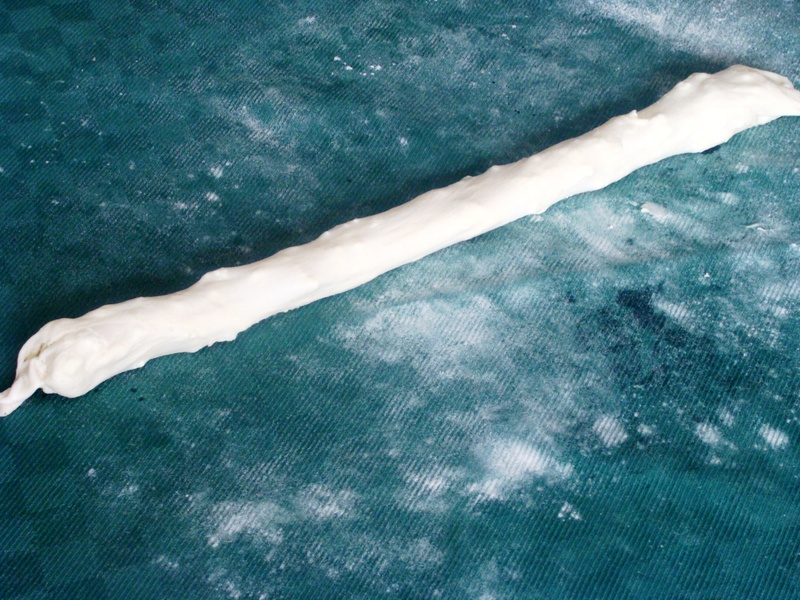 Stretch and pull the dough until it’s tissue-thin. 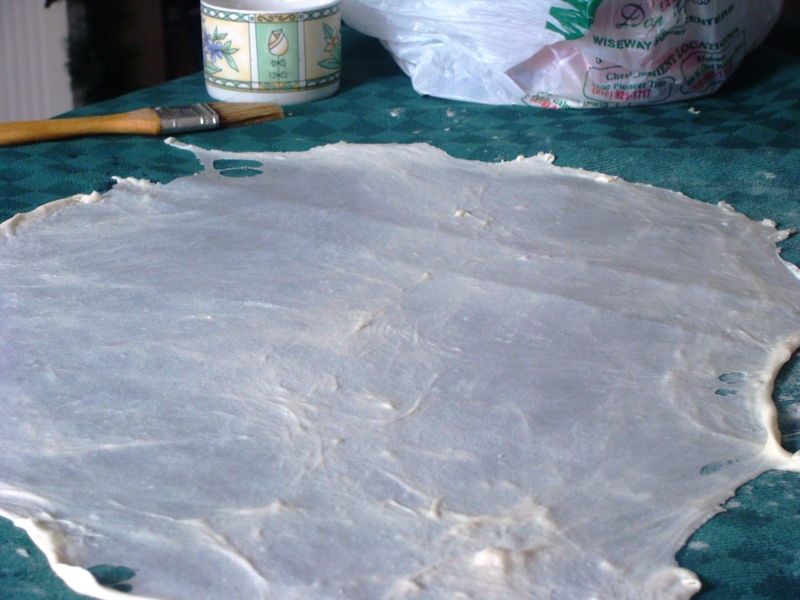 Cut away the thick dough around the edges with scissors. Dip a spoon or brush into a cup of oil, then drizzle over the pastry in a circular motion. Evenly sprinkle with a handful of cheese. 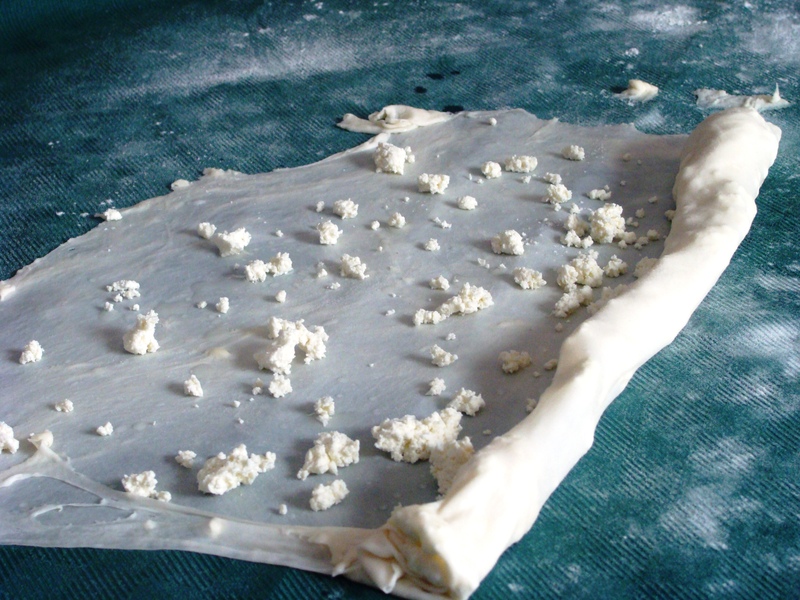 Lift the edges of the tablecloth closest to you and allow the pastry to naturally roll. 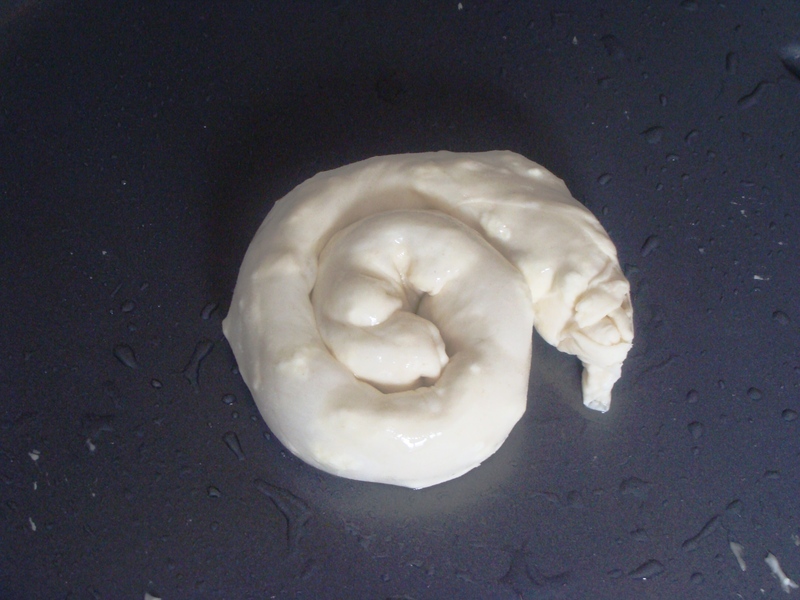 Place the roll in the center of a well-oiled pizza tray and form it into a snail shape. Continue the above steps until you have used up all six dough balls. Once you have a full tray of coils, brush the entire pastry with oil and sprinkle with sesame seeds. Put it in the oven for 35 to 40 minutes or until the top is golden brown. Don’t forget to turn down the temperature to 375! 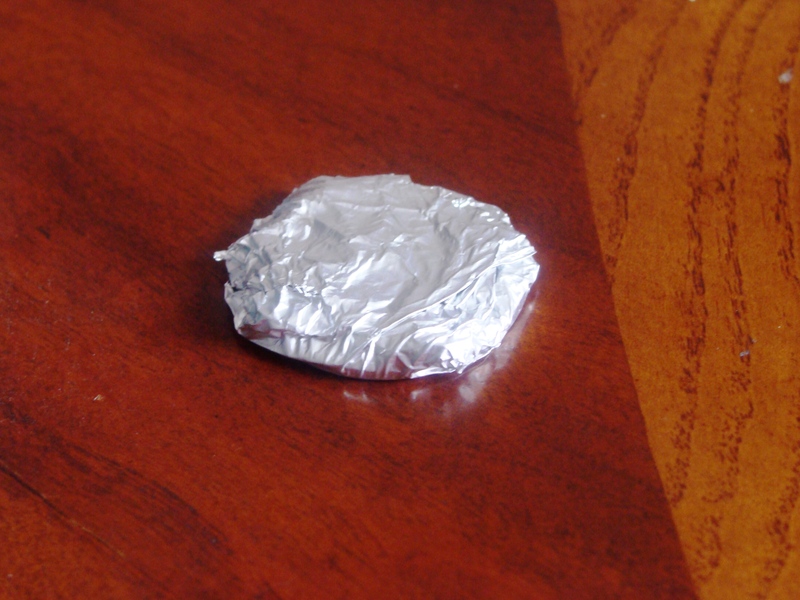 If you want to use the coin, first cover the coin with aluminum foil then put it underneath the Maznik right before it goes into the oven. The best way to enjoy this delicious pastry is with a side of homemade yogurt or a tomato and cucumber salad sprinkled with salt, oil, and vinegar. I attempted to make this recipe but, the results were not great :(. My mom makes this all the time and she sucis it but she could never give me exact measurements so I’m happy to have at least some kind of reference point:). My dough was really soft and stretchable but i couldn’t get them as thin as i wanted to. In the pics your dough looks more shiny, i think i may need to add more water next time. I will definitely keep trying until i get it perfect, thanks for posting! After picking up some feta cheese on Saturday, I made your maznik today. Thank you for the help. That is great! Did it work out for you? I’ve only made one attempt to reproduce my mother’s placinta (Romanian cheese filled strudel) following her instructions … to utter failure. Unfortunately, my mother passed away last year so it’s not possible to get more clarification of her recipe. I hope to be able to get some tips and tricks from the one you posted above. Yeah, stretching it out that far takes a lot of practice! 🙂 But, that’s a sign of good dough. You may not be able to answer this question but, just as an estimate, about how long does it take for the dough to become smooth and elastic in the stand mixer? Five minutes, 10, longer? I know that I kneaded my dough (by hand as my mother used to) but I wonder if it wasn’t long enough. I knead dough for bread and pizza and can pretty much tell by feel when it’s enough so I’m trying to estimate how long this dough would take. Definitely 5 minutes, or maybe even 8… it should be good once you see that it’s a smooth ball of dough. PS: Katerina, I don’t have a blog but I post recipes several times a week with pictures. If you get a chance, please visit. 🙂 Lately, I’ve been on an Indian food kick but I do a wide assortment of cuisines … Canadian, Romanian/Hungarian, Italian, Mexican and everything from soups, candy, desserts and mains. One of my Romanian recipes. Recipe posts are tagged ‘recipe’ and you can use the tags page to visit anything that might be of interest. This is absolutely beautiful. I am so enjoying learning of these semi-recognizable foods. Thank you so much for sharing your history, your cuisine and your passions. Izgleda mnogu vkusno! Bravo za maznikot. Jas kori ne znam da tegnam ama znam da sukam. Treba da se naucam. A new one on me, too, but it looks absolutely delicious!!! I love this tradition. We have something similar in my culture. We celebrate Christmas and New Year on the 25th and 1st, but we also celebrate Christmas on Three Kings Day (Jan. 6). It’s always fun to have that extra holiday after most people have finished celebrating. Mmmm! I just love Feta! Happy New Year! Happy New Year, and love this treat. Similar to the porcelain doll on Jan 6th, Kings Day. Oh my! This looks yummy! I love its golden color and sesame on the top. Would be perfect for our sunday breakfast! Happy celebration, Kate!! Your Мазник looks perfect!! We name that “Mesenitsa” over here 🙂 and is absolutely tasty. cool tradition! cheese filled dough nothing wrong with that! Holy crap! This is completely amazing! The dough sounds super interesting, and I love the story with the coin, great job! You did such a good job getting that pastry thin. So thin! I have never attempted it because I am afraid I will end up with holes all over the place. Happy New Year! It’s so nice to read about new year’s traditions. Maznik looks delicious. I love this! Thank you for sharing a family tradition. I loved reading about the coin!! This sounds so good. I love pastry with any kind of cheese. Love hearing about your traditions. Hope you have a great weekend. Lovely post Kate! The pastry looks so tempting as I sit here with my morning coffee and no breakfast yet. MMm! Happy New Year to you! Oh I just loved learning about this tradition…and congrats to your niece for winning good luck for the upcoming year. 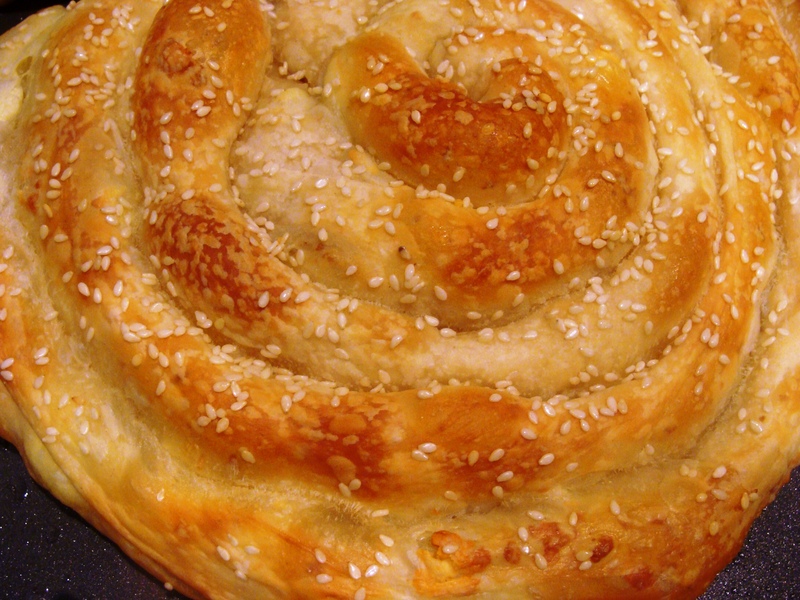 Any pastry wrapped into a spiral and filled with feta sounds just spectacular. Thank you for sharing! Many blessings on you and yours this weekend! See, Maznik just has that “buzz” to it! Happy celebrations. Looks divine. Yes, I remember this tradition, but it was just little bit different. When I was was growing up, we had yeast-less bread(pogacha) and my mom would put a coin in, and we opened it up for Christmas breakfast. Maznik looks amazing, you did fantastic job! What a beautiful pastry! It in itself looks like a reason to celebrate! Happy New Year! Cheese filled pastry? Sounds great to me! I have enjoyed reading about your celebrations and traditions. Thank you for sharing!